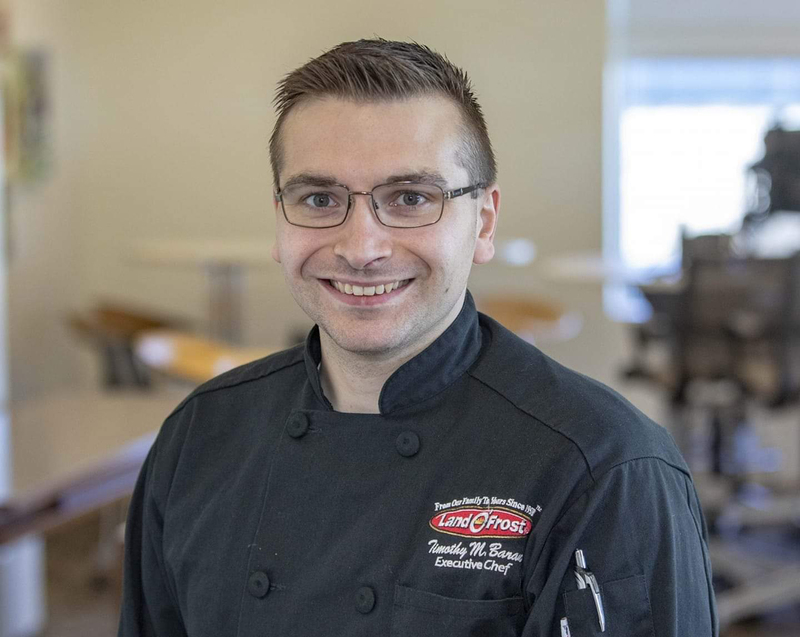 As corporate chef for Chicago-based Land O’Frost and Joliet Junior College Lifelong Learning instructor, culinary arts alumnus Tim Baran is enjoying a successful career. After Baran graduated from JJC in 2013, he served three years as a culinary lab assistant and adjunct professor, before joining Land O’Frost in 2016. He is willing to teach any culinary Lifelong Learning class that is thrown his way. Baran loves to teach. Recently he’s taught classes on knife skills, grilling, soups, pastas and pierogis, pies and more. Baran has many responsibilities with his current role at Land O’Frost. This includes researching and developing new and existing products, creating recipes and videos featuring company products, and overseeing the kitchens. Baran believes that working at a large company like Land O’Frost is an incredible opportunity. “I get to start at the ground floor and help develop new products and work on existing products to make them even better. It’s incredible to step back and watch it all unfold into something that will benefit people in their everyday lives,” said Baran. His favorite part of the job is it allows him to be creative. He likes to try new things with his recipes and figure out better ways to prepare them. Baran says that he’s doing something different every day and that’s what he loves about it. Baran discovered his love for cooking when he was young, by helping his mom make meals for their family of eight. One of the best things he’s done in his career was apprentice for Chef Timothy Bucci, JJC culinary arts instructor, during Bucci’s time on ACF Culinary Team USA. Baran was also an apprentice during Bucci’s training to become Certified Master Chef. He says the biggest challenge for someone trying to enter the culinary field is the time commitment. “Family events, holiday gatherings, weekends and vacations disappear when you start out. Missing out on some life events can be disappointing, but if you remain steadfast in your goals and have a little patience, the culinary world really becomes an incredible place call home,” he said.